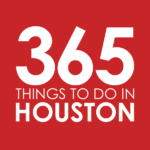 In our series of Must Do Things Around Greater Houston, we take a look at Houston’s vast array of communities and neighborhoods to bring you five fun, tasty, and enticing reasons you should give each a visit. Originally published in 2016, we are now refreshing, updating, and adding to this series, including new neighborhoods and destinations. A mix of gorgeous Victorian buildings and modern mid to high-rises, the original founding point of the city (aka Downtown Houston) is going through a cultural and artistic Renaissance. Lined with soaring business centers, luxurious hotels, renovated and new housing, a plethora of bars and restaurants, a fantastic theater district, urban parks, art galleries and installations, sporting arenas, and even an entire underground tunnel system, Houston’s epicenter pretty much speaks for itself. Though that won’t stop us from saying a little bit about it. Here’s where to eat, drink, and play in Downtown Houston. Eat from morning ‘til night – It should come as no surprise that Downtown is packed with eateries, and fantastic ones at that. Start with lattes and croissants at Boomtown Coffee, huevos rancheros at Barnaby’s or banana’s foster french toast at Toasters. Or how about a bottomless mimosa brunch with bbq shrimp and grits? Get those at The Grove, a modern restaurant sittin’ pretty in Discovery Green. With two Downtown locations, Hearsay is another brunch stunner; and no one pulls out all the stops like Quattro does at its Sunday brunch buffet. For lunch, one of the city’s best double-decker burgers at Hubcap Grill should do the trick, as will sloppy enchiladas at Irma’s, smoked meats galore at Jackson Street BBQ, or “crunchy chicken” sandwiches and harvest salads at Local Foods. Happy hour bites at MKT Bar, El Big Bad, and Batanga will keep you satisfied while you imbibe; and heavy-hitters like Pappas Bros. Steakhouse, Brasserie du Parc, Xochi, Lucienne, and Vic & Anthony’s fit the bill for a wonderful night on the town. And for dinner and a show, hit the burlesque theater and supper club Prohibition. If you’re still hungry for late night eats, beer garden, and food hall Conservatory is the way to go; and be sure to check out Finn Hall and Bravery Chef Hall, too. 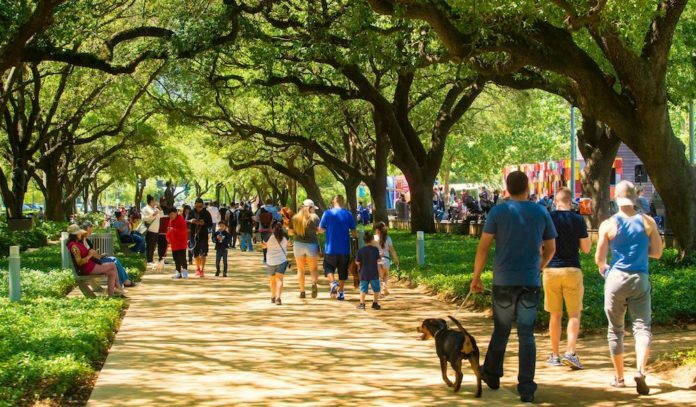 Spend some time in the park – Downtown Houston boasts a number of urban parks, including Sam Houston Park, Tranquility Park, and Sesquicentennial Park. The hottest two, however, are Discovery Green and Market Square Park. Discovery Green boasts 12 acres in the heart of the city, with a small lake for kayaking and stand-up paddleboarding, two dog runs, a children’s area, and ample room for recreation. Hit it for special events, including magnificent light and art installations, stage performances, festivals, movie screenings, pop-up markets, group yoga, and even an ice-skating rink in the winter. The historic Market Square Park may be tiny, but with a Niko Niko’s stand, shady walkways, dog runs, and a packed calendar of events, it’s full of fun. Head here for Blanket Bingo, the Alamo Drafthouse Rolling Roadshow, outdoor markets, and festivals. Experience the arts in the Theater District – From the Houston is Inspired graffiti wall to grandiose theaters housing Houston’s ballet and symphony, Downtown is a mecca of art and culture. The Hobby Center presents hit Broadway-quality performances like Into the Woods, The Book of Mormon, and Wicked. At Jones Hall, listening to the Houston Symphony is a gift to the soul, while at the Wortham Theater Center, the Houston Ballet company puts on divine productions that will leave you wanting more. The Houston Grand Opera, also at the Wortham Center, is another delight. Going on its 70th season, the Alley Theatre company puts on performances of award-winning comedies, treasured classics, and international thrillers. But that’s just the beginning; there are also arenas for concerts, art and music festivals, and special events. Get out and explore it all. Embark on a bar crawl of epic proportions – In a surprise to absolutely no one, Downtown Houston has no shortage of watering holes. So why not make your way through them on an epic bar crawl? Start just outside of Market Square Park at Public Services Wine & Whisky, where you’ll find Old World wines and spirits set in a gorgeous space inside the historic Houston Cotton Exchange Building; or Houston Watch Company, a throwback bar serves old-fashioned drinks the modern way. Move on to La Carafe, Char Bar, and Warren’s Inn, some of the oldest bars in Houston set right on Market Square. Next, it’s drinking for a cause at OKRA Charity Saloon before making your way to the strip of bars along Main. There are expertly-crafted classics and re-invented cocktails at Captain Foxheart’s Bad News Bar & Spirit Lodge, mezcal-spiked libations at The Pastry War, and a formal (but unstuffy) cocktail experience at Tongue-Cut Sparrow, all of three which are easily some of the best cocktail bars in the city. If beer is more your speed, Bovine & Barley and Flying Saucer are just a few blocks down. So is Sunny’s, where you can end the night with Jell-O shots if you dare. Maybe you should make one more stop at Frank’s or Roma’s for pizza before hitting the hay. Root for the home teams – Downtown, Houston’s epicenter, is home to three sporting arenas. At the Toyota Center, the Houston Rockets play to a crowd of roaring fans. For the rowdiest time, join the Red Rowdies in section 114. At Minute Maid Park, cheer on the Astros while you take down coffee-rubbed salmon tacos or a chopped bbq-loaded baked potato the size of Texas. Immediately east of Downtown, BBVA Compass Stadium plays home to both the men’s Houston Dynamo and women’s Houston Dash soccer teams. Go Houston!